Not sure about that one, might leave the diff open just so I dont break it by welding it wrong or something haha. Even with an open differential she should have lots of pulling power I sould think. Yeah hopefully she does alright. Jeez page 2 already! And no progress has been made hahaha. As long as there is traction they seem to do pretty good. Ide like to lock on of mine, probably under the 69 Suburban... but without any welding. There was a member here "Moose"? 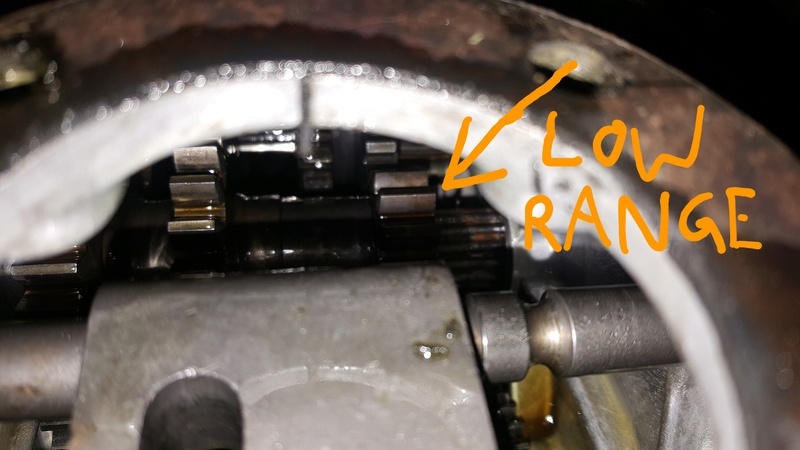 I think who locked a similar transaxle with an additional gear between the axle shafts. Im thinking these can be locked the same. When I get another one Ill find out! Could be. 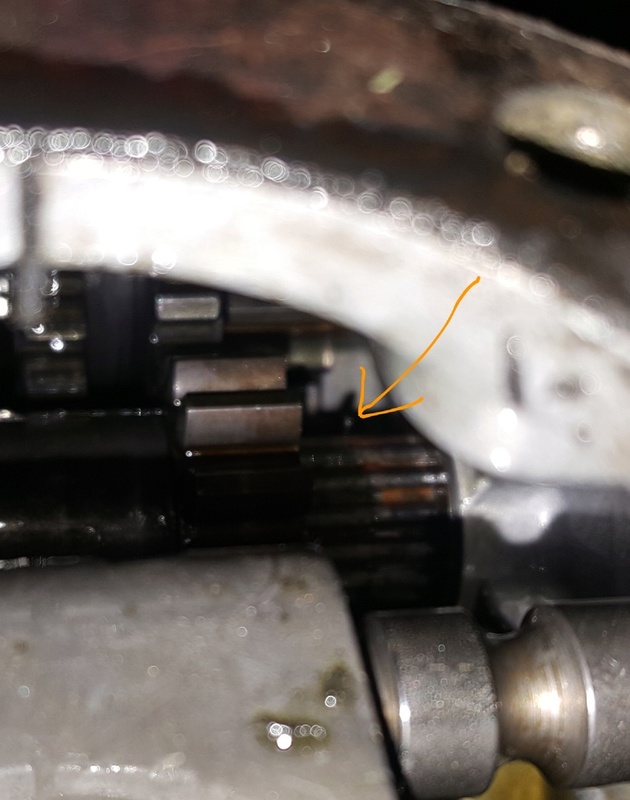 I know that you can flip a couple of the planetary gears in the differential and that locks everything up, but I've also heard that can blow up and wreck you transaxle. Who knows haha. 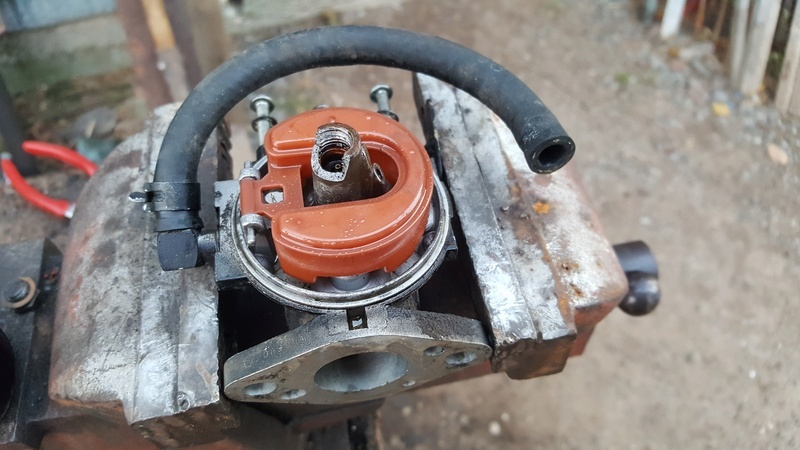 Anyway I got another carb for the Kohler today! The elbow for the air cleaner bolts right on. I swapped the throttle and choke shaft over from the broken original carb to this one, so it should work out great! Sweet! Hope you can get that Kohler fired up soon! I bet it is a beast! Yeah I hope so too haha, should be a real power plant! Well I took the shifter assembly out of the trans today because I'm fairly certain this is an internal problem. I actually got it to go in low range, but I had to finesse the input gear for the ranges with a screw driver. What I've figured out is the input gear for low range is sliding on the splined shaft, so when the sliding gear for low range moves over it pushes the input gear out of the way. I managed to get some pics through the shifter hole. AHA I feexed it! It turns out theres like a really strong C-clip thing that snaps on the splines on the shaft. As you can see is way over to the side which is why the low range gear was sliding back and forth. All I had to do was use a prybar and a mallet to tap it back up against the low range gear, it was kinda hard to move it cuz it's pretty strong, but it works now! It goes into low range no problem! I'm glad it was nothing major and now I can put 'er all back together and see if I can get this thing running and driving. Stay tuned! That is some good information Allis. I have not see this issue with this transmission before. Good job! Thanks mighty! I'm just glad it was something simple really. If I knew how with this version of forum, there use to be a duplicate forum. I think your transaxle info is tech worthy. EDIT: I quoted you over in the Tech forum. I thought it was really good info. Cool! Hopefully that helps someone out some day. 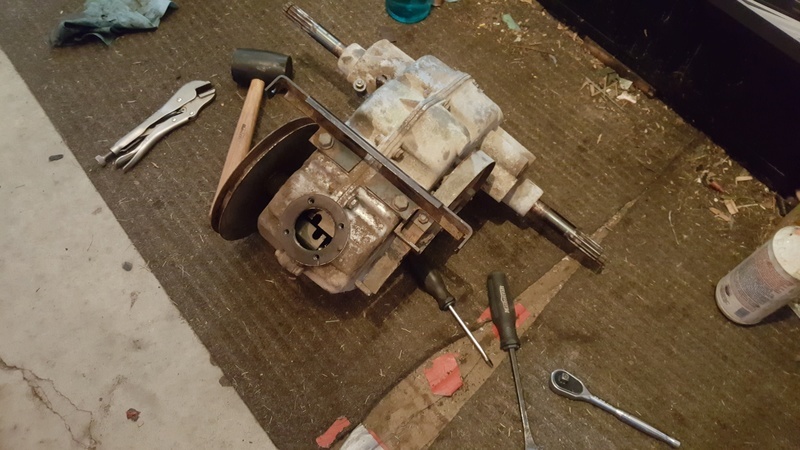 Anyways I got the transaxle all bolted up and the carb put on over the weekend. 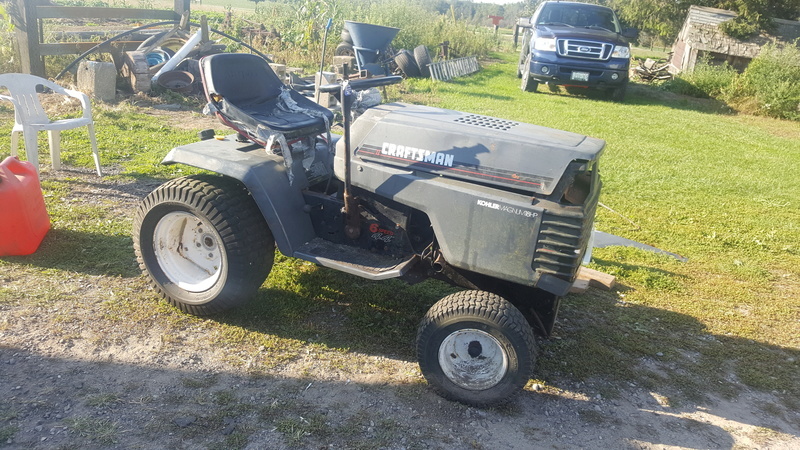 We got it running, but it was running way too lean and it wouldnt even idle down. 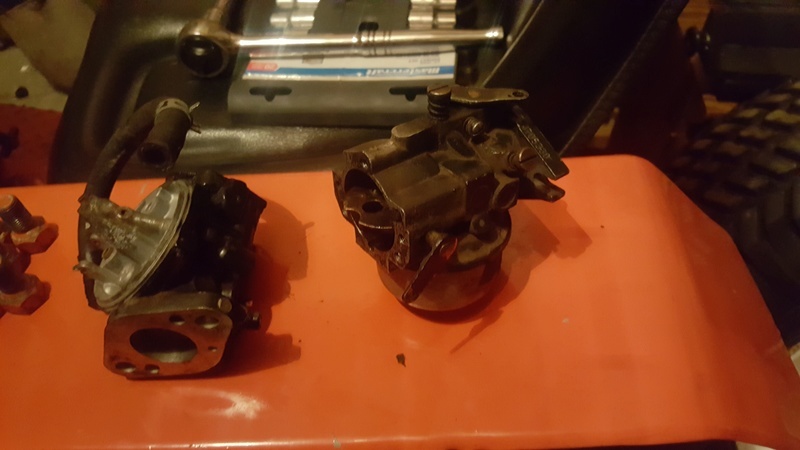 Turns out I forgot to put a gasket between the carb and the elbow for the air cleaner. So I sealed that up and let it sit over night. I fire it ul today and it runs okay and I drive it out of the barn an it starts flooding real bad and dies. Now it will runs for a couple seconds then flood out and wont start again. I think it's because I bent the tab on the float for the needle up cuz I thought it looked wrong but it was probably fine. So now I gotta the carburetor off and re-set the float hahaha. Oh well, at least we know it runs! Excellent. I forgot, what was the reason you swapped carbs? Yep hahaha. The bolt was crossed threaded in at one point and I went to break it loose and the casting just snapped. Just as well I guess, the jets where full of rust. Nothin a little strategic JB weld cant fix! Yeah haha. It would probably be possible really, but the threads were stripped so she was really screwed. You thinking readjusting the float will work with that other carb? No other leaks into the bowl? The carb thats on there now yes, it's a bit older so it doesnt have a plastic float. Just need to bend the little tab for the needle back to where it's supposed to be. I like the old non-plastic floats for that reason. You can bend them back to shape. The plastic ones are a bit tricky to bend back to shape. Yeah no kidding, the only downside is they can rot out. Although if they get a little pin hole in them you can solder the hole. New ones depending on carb are pretty cheap. I got one for an onan for 15$. Well I never got around to trying to get this thing running again, between the MTD and the Ford I was kinda distracted haha. But sometime maybe this week or so I would like to try and get 'er going. Once I getting it running and driving properly I can start modifying it, and that's always the most fun part! I was planning on using the coilovers I found for the suspension on this but they ended up on the Ford so my plans are gonna have to change, but I think I know where I can maybe get some old coils from a car that should be the right size for this thing. We'll have to see I guess, but I just thought I'd let you guys know what's up with the 'ol Craftsman! 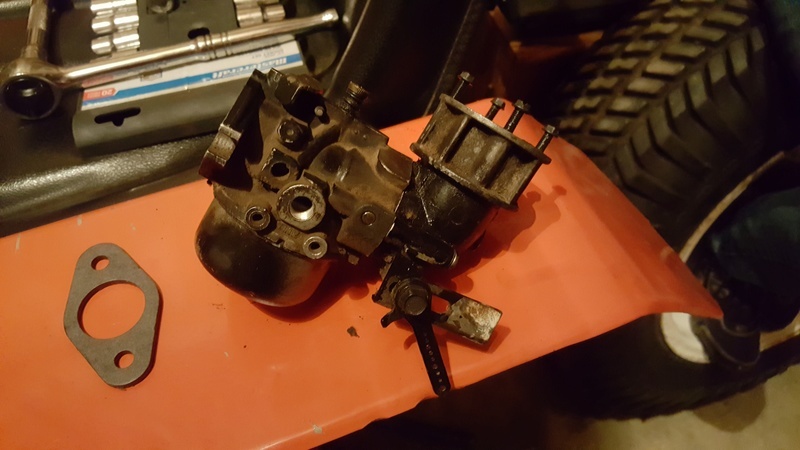 Yeah some budget aftermarket carbs are super cheap online. Sometimes it doesn't even make sense to try cleaning one out. Just replace the entire thing, by the time you buy a gasket kit for the original one.